Bob McDonald ​is one of Canada’s best-known science journalists, bringing science to the public for more than 40 years. 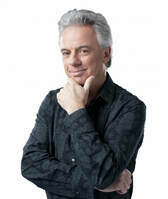 In addition to hosting Quirks & Quarks, the award-winning science program that is heard by 500,000 people each week, Bob is also a science correspondent for CBC TV’s The National and host and writer of the children’s series Head’s Up. Bob has also authored four bestselling science books including Measuring the Earth with a Stick: Science as I've seen it, a book which a collection of essays reflecting on his 25 years as a science journalist, and his latest book Canadian Space Walkers: Hadfield, MacLean and Williams Remember the Ultimate High Adventure. Bob has contributed as host and writer of numerous television documentaries and more than 100 educational videos in Canada and the United States as well as numerous textbooks, magazines, and newspapers. An Officer of the Order of Canada and a recipient of the Queen’s Jubilee Medal, Bob has been personally honoured for his contributions to the public awareness of science with the 2001 Michael Smith Award for Science Promotion; the 2002 Sandford Fleming Medal from The Royal Canadian Institute; in 2005, the McNeil Medal for the Public Awareness of Science from the Royal Society of Canada - completing the 'triple crown' of medals for science communication in Canada. In 2010, Bob was named as an honorary life member of the Sigma Xi Society, the first Canadian to be so honoured by America's oldest scientific body. He also won a 2008 Gemini Award for Best Host in a Pre-School, Children’s or Youth Program or Series. In 2015, asteroid 332324 was officially named “Bobmcdonald” in his honour by the International Astronomical Union. Dr. Bob McDonald holds 12 honorary doctorates from Canadian universities. Additional Workshop Hosts details will be posted as they become available. Wilfred Buck is a member of the Opaskwayak Cree Nation, employed by the Manitoba First Nations Education Resource Centre as a Science Facilitator. He obtained his B.Ed. & Post Bacc. from the University of Manitoba. As an educator Wilfred has had the opportunity and good fortune to travel to South and Central America as well as Europe and met, shared and listened to Indigenous people from all over the world. He is a husband, father of four, son, uncle, brother, nephew, story-teller, mad scientist, teacher, singer, pipe-carrier, sweat lodge keeper, old person and sun dance leader. As Science Facilitator, Wilfred has been working with First Nations schools to bring Indigenous perspectives to teaching science. Buck is well known for his star stories and for using a mobile dome-shaped planetarium to teach First Nations students about Cree constellations, such as Atima Atchakosuk: The Dog Stars and Niska: The Goose. Wilfred launched his first book, Tipiskawi Kisik: Night Sky Star Stories, which holds a myriad of tales rooted in an Ininew (Cree) perspective. Through an exploration of stars and constellations and their associated mythologies, this book presents age-old knowledge held by Indigenous people prior to European contact. These stories can be passed on to the next generation, so they will know of the rich history, science practices, and culture of the Ininew people. “The greatest teaching that was ever given to me, other than my wife and children, is the ability to see the humor in the world”…Wilfred Buck.